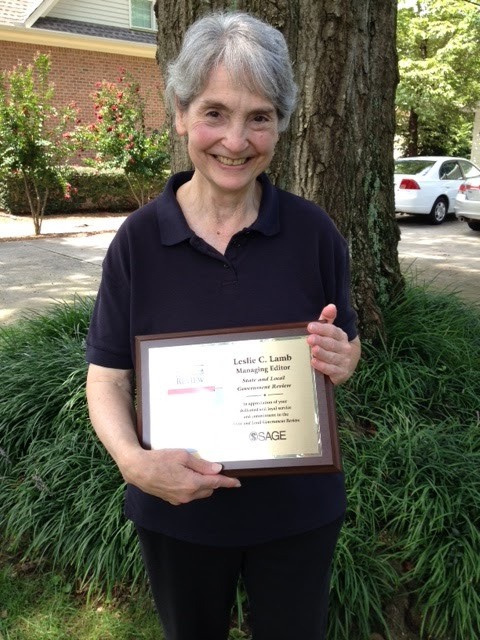 On August 24, SAGE honored Leslie Lamb for her distinguished service as Managing Editor of the State and Local Government Review. A beautiful plaque was presented to Leslie at a luncheon hosted by Dr. Richard Campbell who was previously State and Local Editor. Mike Scicchitano, the current Editor, called during the luncheon to offer his congratulations to Leslie. Leslie did a superlative job during her stint as Managing Editor and was able to make it possible for a seamless transition for State and Local from The Carl Vinson Institute at the University of Georgia to SAGE. Her affable personality, commitment to excellence, and team spirit approach to her job were genuine qualities that were noticed by everyone who came into contact with her. By SIAM-ASPA in http://schemas.google.com/blogger/2008/kind#post, Leslie Lamb on November 14, 2015 .